Introduced for Reach last fall, our Adaptive Links automatically detect the device OS and install the appropriate pass. Now you can create Adaptive Links from the dashboard. Create an Adaptive Link by associating an Apple Wallet template with a Google Pay template. Choose your project from the dashboard, then click Templates in the navigational header. Select a template, then click the Select an Apple/Google Pay template button. 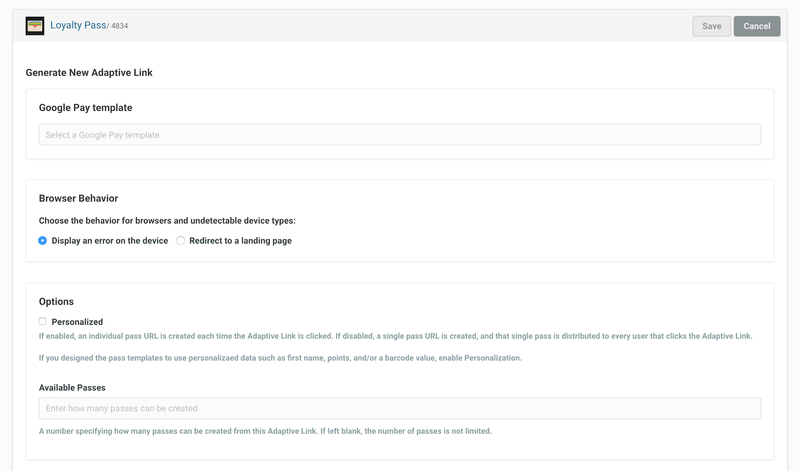 Configure the Adaptive Link, including specifying behaviors for browsers and incompatible devices, enabling personalization, and limiting the number of passes that may be created from the link. Get the full details in Templates Menu Guide: Adaptive Links.